When you begin a new Articulate Quizmaker quiz, the content area (the slide stage) defaults to 720 pixels wide by 540 pixels high. Switch to Question List View or Slide View. Go to the Design tab, and click Quiz Size. 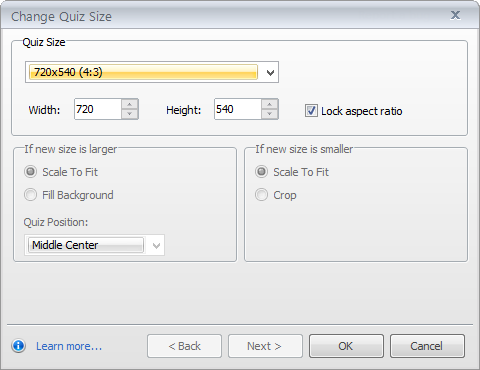 When the Change Quiz Size window appears, choose an option from the Quiz Size selector. If you choose Custom, enter the Width and Height values (in pixels). Mark the Lock aspect ratio box if you want to maintain the current proportions for objects that have locked aspect ratios. Fill Background: This retains the current slide background and applies it to the new size, but it doesn't resize your slide content. If you choose this option, use the corresponding Quiz Position drop-down to choose where existing content should appear on your slides. Crop: This crops your content to fit within the new size. If you choose this option, the Next button will become active. Click Next to define the crop area of each slide in your quiz. Move the green box to indicate the portion of each slide you want to keep. Click Apply to All Slides, or use the green arrows to navigate through your slides. Click OK to accept the new quiz size. Tip: It's best to change your quiz size before you add any slides. Otherwise, you may need to resize or rearrange objects in your quiz to accommodate its new size. 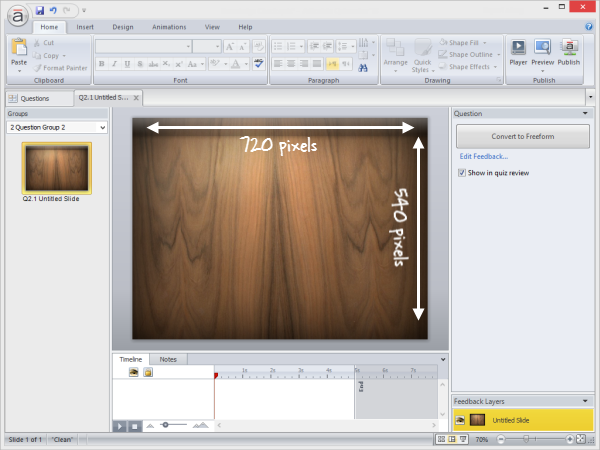 When embedding a quiz in Presenter, we recommend using the same size in Quizmaker and PowerPoint for the best results. (See Choosing a Presentation Size.) If they're different, the quiz will be centered on the PowerPoint slide and, if necessary, scaled down to fit within the slide. Go to the Articulate tab on the ribbon, and click Player. 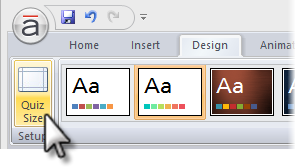 Click Colors & Effects on the ribbon. 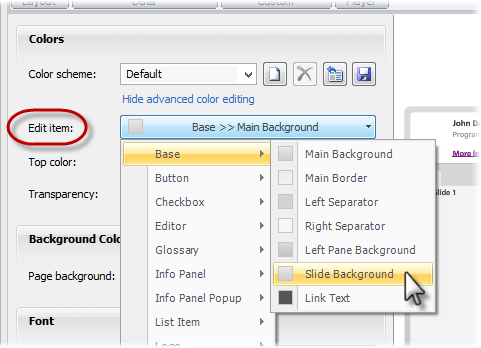 From the Edit item drop-down, choose Base >> Slide Background. 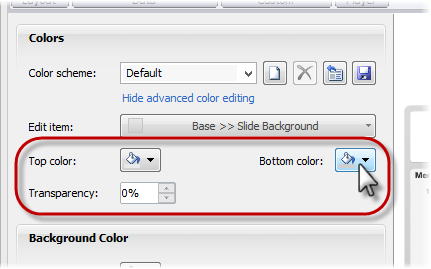 Use Top color, Bottom color, and Transparency to set your color options. Also, when a quiz is part of a Presenter course, the player colors in Presenter take precedence over the player colors in Quizmaker. Be sure to set your player colors in Presenter.